Horses don’t like being ridden when it’s foggy, they spook when they see monsters looming. When I came home, I went to turn out the lights in the goat house. 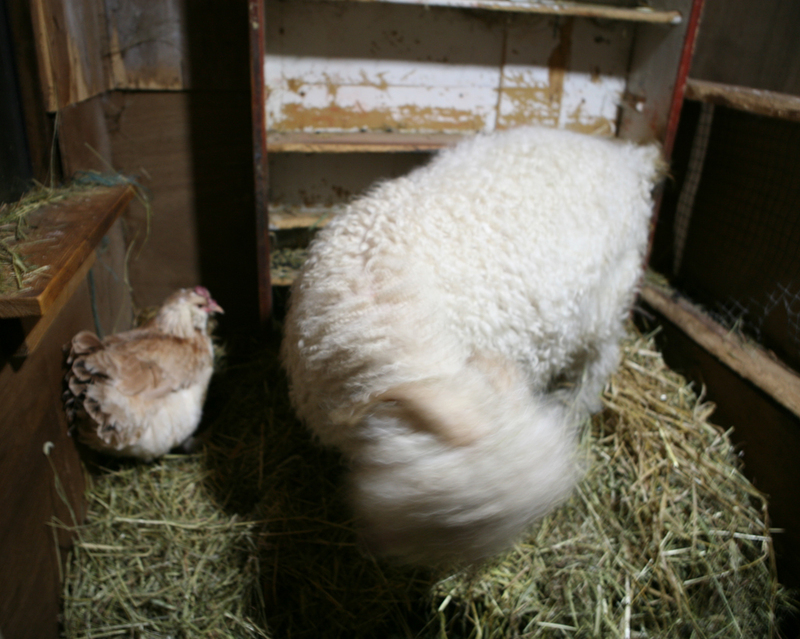 Last week, Champagne — the only hen to have actually been hatched here — died. She was quite old: eight, I think. 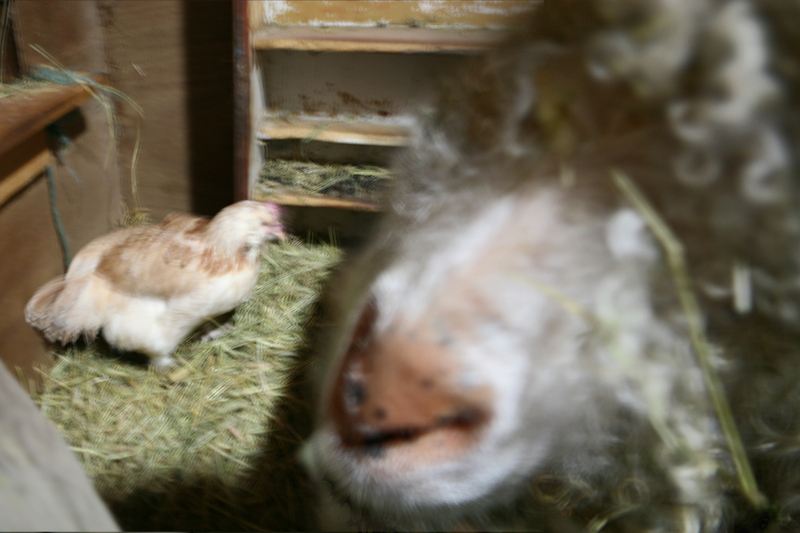 Now we have only one hen left and that’s Cloudy. My daughter and I tried to find some more Faverolles to buy; they lay small eggs, but they’re very friendly and I like their feathery feet. There aren’t any Faverolles available in southern Norway at the moment; so for now she’s on her own, species-wise. For the first couple of nights, while my wife was away in Stavanger working, we let Cloudy sleep in a cage in the living room. It got awfully dusty. 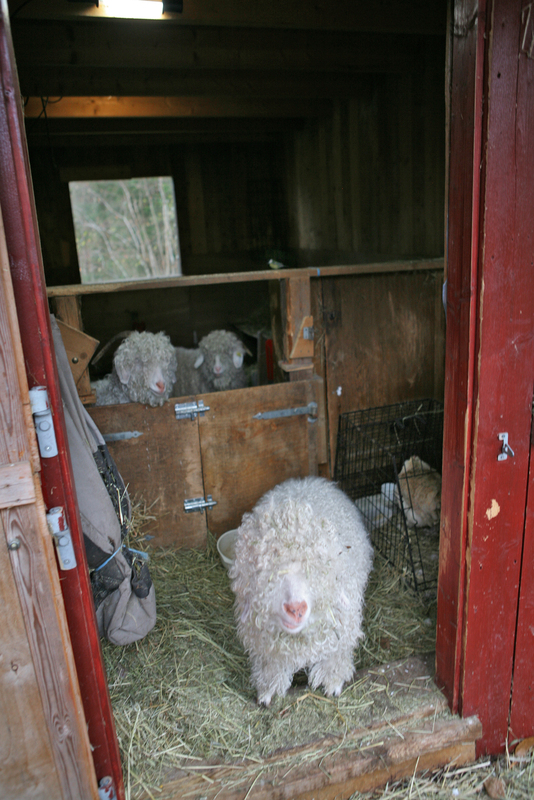 When my wife returned, she suggested that Cloudy might enjoy living with the goats. 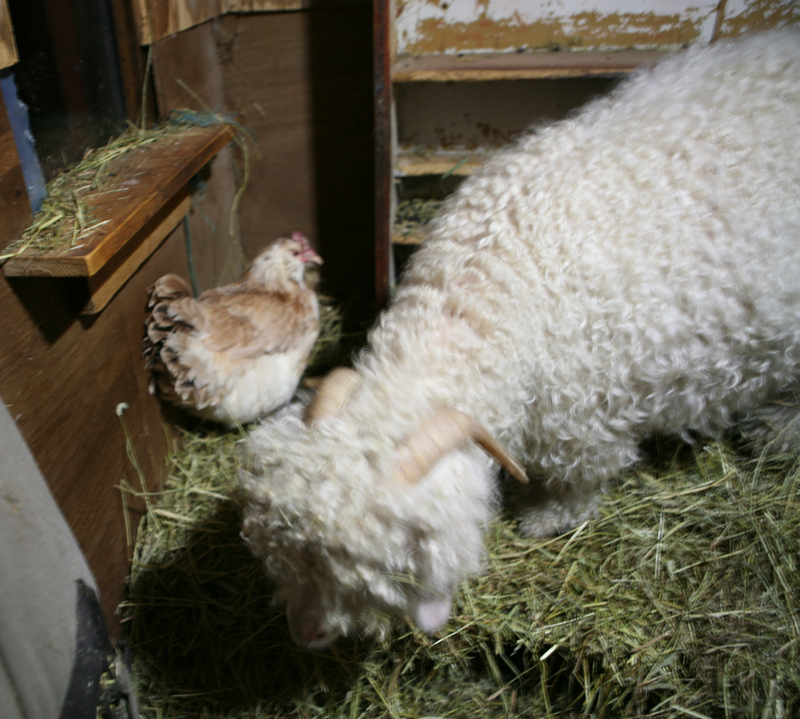 Cloudy’s always spent the odd day in the goathouse; sometimes she lays eggs there. Every night Cloudy climbs up to sleep on Vesla’s bed. Maybe it’s warmer up there or possibly they just like the company. Cloudy looks happy with her friends. Well, I could get a rough idea of what it’s about and it looked jolly interesting. Too bad I don’t speak Spanish. I don’t think my daughter would understand it either. I don’t think my mother could help, she doesn’t speak Spanish. I was not aware that Julia maintains a blog in Spanish. Very useful, as I make myself read at least a thousand words a day to maintain what I have and add the odd new word. This time it was ‘crisol’ – thanks! The photos remind me of mountain life in Guatemala; there was a hen that lived under the bed I was offered and in the morning a gang of ducks would come in and wander around. There was no clear divide between inside and outside, between where the animals lived and where the people lived. It was the furthest I have ever felt from the life I grew up with in England and it was lovely, the air in the night was so soft and pure that every breath was infused with pleasure. Oh, really, AJP? I did not realize that! At last, another Spanish speaker. That’s a fantastic paragraph, it makes me want to go there immediately. I love places that have no division between inside and outside. When we first got the goats they were three months old and we had to sleep with them for the first two weeks so that they would think of us as part of the flock. We slept on the straw, and you’d get woken up in the middle of the night and there would be a goat peering at you really closely. No, don’t stop, Julia. I like it. Si, Julia, es un cambio profundo de las paginas de El Pais y La Prensa Libre de Guatemala. ¿De donde es Ud.? Mmmm, I don’t know, AJP… what people will think of me? Soy de Buenos Aires, Argentina, pinhut. My time in Central America cured me completely of the English phobia of creepy-crawlies. In the room slept myself, Madeli, who was the maid of my girlfriend’s family, her two sons and her father (fairly large room). Through cracks between the tops of the walls and the roof, the night sky was visible and moments before lights out, a small rat or two would appear. “Hay solo un raton, Jason…” said Madeli, switching off the light. Naturally, I imagined trying this sentence out on my friends and family back in the UK and had a quiet chuckle to myself in the dark. And then just fall asleep. Later I topped this by dozing off with a tarantula in my room in Palenque, Mexico. Muy bien. Todas partes al sur de Costa Rica son desconocidas a mi. I used to have a great-aunt in Buenos Aires. Maybe we should take Alma there, she could speak Spanish and ride. I’m sure she’d love it (me too). Pinhut says he is missing Guatemala, maybe he could try Argentina next. Sure, speak Spanish and ride are two things we can assure you. Have a great time I do not know…, but I hope it. Alma is a Spanish name? As for “soul”? Spanish or Latin. But Spanish. It’s a fairly unusual, perhaps a bit old-fashioned, name in both English and Norwegian. And German, I guess (Alma Mahler). Actually I knew “Alma mater” but I hadn’t ever asked myself why she wasn’t “Anima mater”. Many thanks once again for your great good grace in inviting us to share the abundant warmth and life of your little … family, should one call it? We are awash with cats here, but after experiencing one of your posts, we can’t help but envy the superior variety of fur and feathers. Once upon a time, hitchhiking with a friend in the mountains of Greece (this would have been c. 1964), we were offered accommodation by a local goatherd. There were of course no hotels or hostels within many miles, rugged terrain, cold night falling. So we immediately accepted, and spent the night in the straw among the goats. 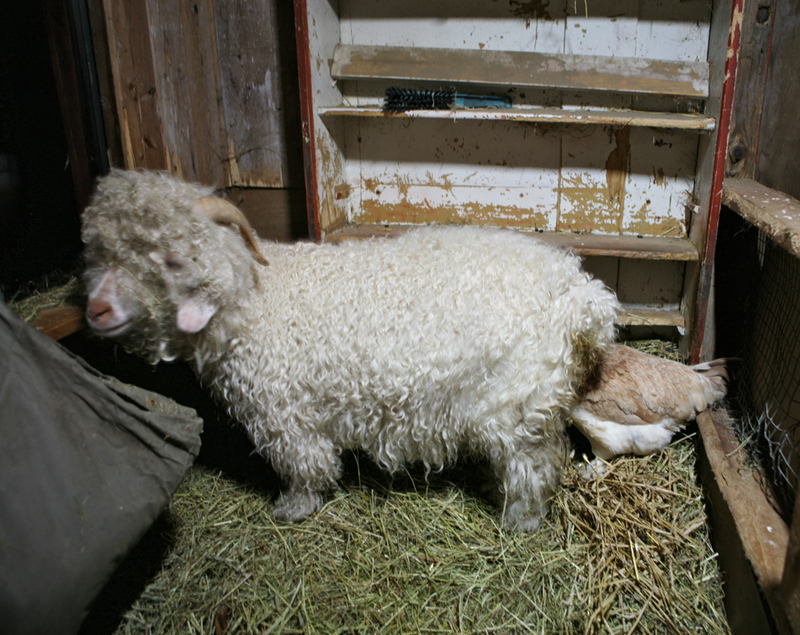 Your account of those nights in the straw with the goats brings back that memory. There was not much sleep, but a marvelous securing feeling, being warm, there, among the animals. Yes, “alma” in latin means something more like “nutritious”. There’s a famous poem by Fray Luis de León that begins “Alma región luciente…” (http://www.poesi.as/fll13.htm) and by that he refers to Christ, the shepherd who take care of his flock but at the same time is the food for them (in Spanish “shepherd” is “pastor”, very similar to “pasto” = grass) . The important thing is that Alma it’s a beautiful name for a girl. I agree with Tom that your species are more interesting. Cats aren’t terribly hospitable to other species (the ones they bring in are dead), or even other sexes. I had a tom that I brought in from Saudi Arabia, at some expense, but the five she-cats got him out in the end. Being an Ayrab he then took to terrorising my friends round the corner, and just because they fed him didn’t mean he wouldn’t take a swipe at them if the service wasn’t to his liking. Pinhut: I make myself read at least a thousand words a day to maintain what I have and add the odd new word. I am not as disciplined as you are, but when reading Spanish I read it aloud (there is no one else to hear me). With Spanish spelling being the wonderful way it is, there is no hesitation about the correct pronunciation and stress placement as there would be in most other languages (even in Italian, for instance). One great advantage of reading aloud is that you get to pronounce not only common and useful words and sentences, but things that you would neverve able to say aloud, either because they are typical of written style, or because some of the situations you read about are like nothing in your own experience. Also (very important) you get to practice verb forms which are beyond your active capacity (I have never tried to consciously memorize Spanish verb forms, but they usually come to me from this brain storage when I need them). My command of Spanish, both active and passive, is far from being as good as my English (except in pronunciation, where I am better in Spanish), but I have been told that I have a sophisticated Spanish vocabulary, which I attribute to my habit not only of reading Spanish, but of reading it aloud to myself. I therefore recommend this method where possible. Thank you all for these marvelous comments. I can see I’m not going to have time to do much blogging today, but I may put up a post later. I have a certain *tendency* that is sadly too often mistaken for my character. This permits me to both store and recall information in volume, without any perceptible decay regardless of use. Actually, if I recall a word that I have not used for a sufficient period of time (ie: often more than a year) then I will also remember where I last used it. So I was sort of fibbing about ‘protecting what I have’ but I do like to keep adding stock phrases and formulations from written Spanish, rather than from less well-formed spoken conversation and, as on Julia’s blog, when the subject matter is outside ‘el cotidiano’ there’s the chance to log some new examples even if the chance to use them won’t arise for a while (like all my sailing terminology from reading the letters of Cristóbal Colón.) This week I noticed, for example, that our phrase in English, ‘up to our neck’ has an equivalent in Spanish of ‘up to the eyebrows’! I can’t risk speaking to myself because I only have one friend in the whole city and we only meet two or three times a month – too much talking to thin air and I’ll go insane in short order. Does Vesla ever eat the gegs? And if she scoffed them shell-and-all, would you know? “gegs” is either an arcane Scots word meaning “eggs”, or a typo. jajaja oh, no… I mean hahaha!! m-l: my french is terrible, but sometimes I need to read it out loud to comprehend the meaning, other times I just did not not how to pronounce it …y eso, sin duda, es peor. Gegs sounds Scottish (scotch whisky is stored in kegs). I have no reason to suspect Vesla of eating eggs. Really, they aren’t the kind of thing goats like. They like things made with grain, bread and biscuits, but not dairy products. Dogs love dairy products (yoghurt and cheese), but then dogs will eat almost anything. Pinhut, are you worried that your brain might get full, no memory left? Could I learn Spanish by reading it aloud? Do they still artificially fabricate cylindrical eggs for use in sliced veal & egg pie? cylindrical eggs! They do that? I generally find it harder, much harder, to forget than to remember. I think this is why I never have had much use for ‘entertainment’, because I can’t just watch or listen to something and instantly forget it (this is generally equated to snobbery, but it’s not). So I limit the amount of sensory stimulation I receive, no television, no cinema, almost no music, few trips to bars, etc. The internet is my chief vice, the play of forces between familiarity, novelty and speed is just a direct appeal to how my mind works. My other vice is online Scrabble! where remembering all the previous words you’ve used is a bonus. Developing a decent accent is still difficult with Spanish. I went through a longish phase of saying the correct words in the correct order but not being understood because they did not sound right. I think the two things are opposite sides of the same coin, because of the stability of the Spanish language (and it has changed so much less over the centuries than, for example, English) the pronunciation has to be a bit closer than a foreigner speaking English. Guatemalans, Mexicans, El Salvadorans, etc, just did not seem to be able to make that much of an allowance or even to be creative about trying to guess. So you may as well just spend the time saying the vowels aloud. pinhut, do you know Borges’ short story “Funes el memorioso”? I’m just the opposite: I have no memory at all. Yes, AJ, I know it. Thankfully, my life is not quite like that. There is speculation it was based on an actual person. One event, maybe Julia has been to it, or particpated, is that there is an annual Beckett conference in BA? I’d love to go to that. The English ones look a lot like that, just nowhere near as good. I’ve forgotten how they do it. It’s taking me a while to figure out, but it’s worth it, I think. My favourite Beckett novel (also have a soft spot for the obsessive nature of Watt). And probably my favourite sentence from everything I have read. Why do so many great writers have names beginning with ‘B’? pinhut, I’m glad your life is not like Funes’! Never been to the Beckett Festival. I should. It’s a shame… too many things to do in Buenos Aires and I’m so lazy! “cylindrical eggs! They do that?” A vague memory says they do it, or used to, with a device like a climbing-film evaporator. But my memory is very patchy. 7 (writers) x 24 letters (few names beginning with x or z) = a mere 168 great writers. Thanks, Julia. We’ll make it. Learn Spanish or starve!